In order to understand why we decided to build a treehouse, you’ve got to meet the tree in our yard. The tree. And a lawn that needs mowing. The first thing you’ll notice is that it’s big. 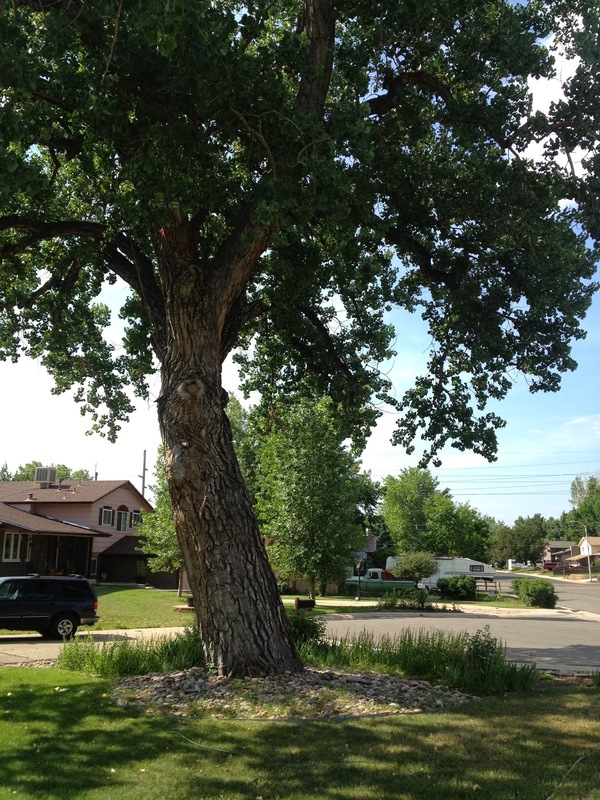 It’s a sort of cottonless cottonwood, a white poplar that’s 100 years old if it’s a day. It would take three adults holding hands to reach all the way around it at its base. This tree is easily one of the biggest reasons we bought our house; rolling up to it for the first time, it’s pretty breathtaking. It keeps a good amount of shade on the yard during the summer — and helps keep the house cool as well. It sounds lovely under a light breeze, and all sorts of critters come in and out of it — all manner of small birds, squirrels, hawks and even a raccoon have been spotted in our tree. It’s so big it’s got roots down into the water table — we don’t water it, it takes care of itself. And while the leaf drop in the fall is epic (seriously, we put out 20 bags of leaves every week for about two months), it’s a tree that's been well looked after over the years. 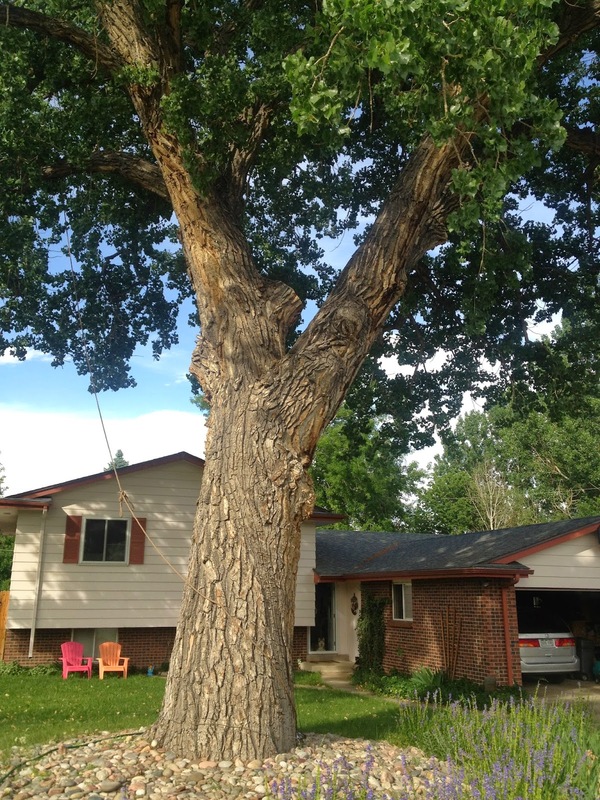 It’s got a great shape, and has clearly been professionally pruned several times over its long life. The second thing you might notice is our rope swing. That went up pretty quickly after we moved in; we’ve got a tire swing that clips onto the loop with a carabiner, and it’s great fun. The branch it’s attached to at the top is almost two feet in diameter, so it’s not going anywhere no matter how many kids we load on. People ask how I got up there to tie the rope swing, but the truth is, I didn’t. First I threw a weighted fishing line up — got it over the branch I wanted after several tries. I tied the fishing line to some cord, pulled that over. Then I tied the cord to the heavy rope, pulled that over. 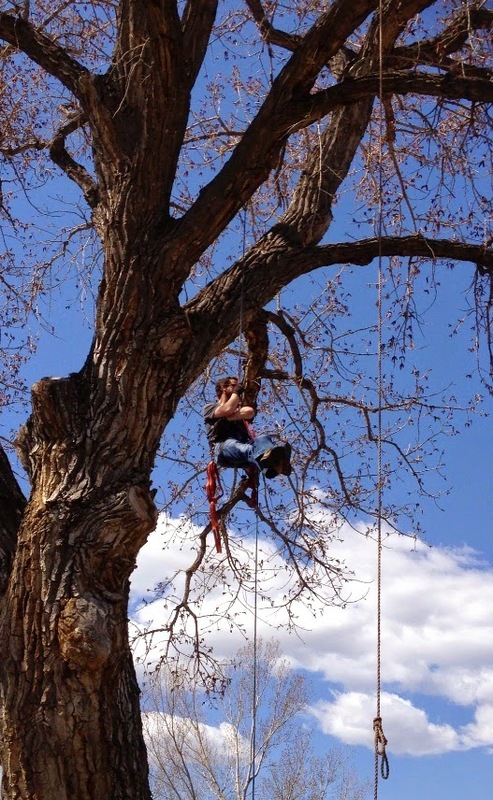 Put a loop in one end, pulled the rope through the loop so it lassoed the branch, and presto: 35-foot rope swing. The tree also has what you might call a lean, but it’s not exactly a lean. This picture shows it pretty well. Also shows some weeding needs doin'. It grows up at a bit of an angle, then comes back. It’s in good balance, but the effect is a sloped side that, along with the large cracks in the bark, makes for a rather climbable approach from one direction. I knew it was only a matter of time before my daughter, who climbs everything, would start up the tree. So my thought was I could get up there first, set up an anchor for top-rope climbing, and she could wear a harness and climb (on belay) to her heart’s content. 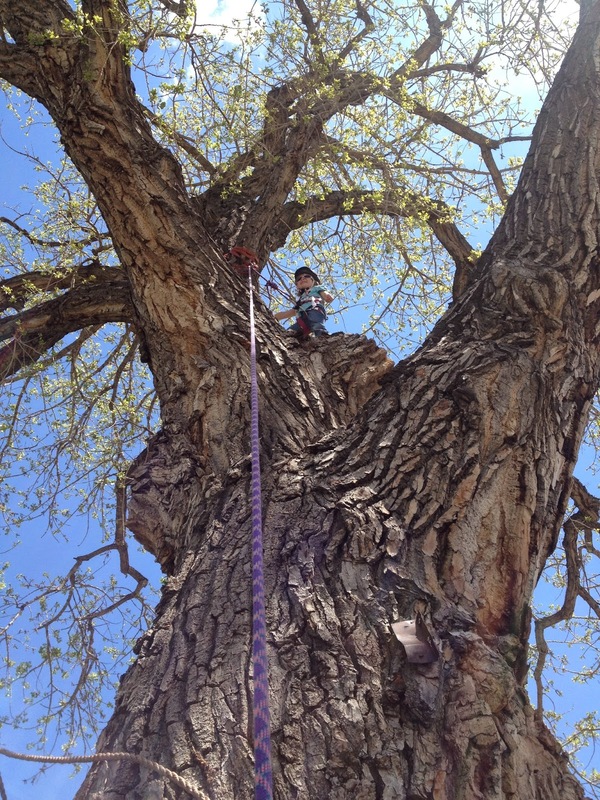 So one day in early spring, I decided to climb into the tree for the first time. I used my weighted cord trick to get a loop of climbing rope over another big branch; I wanted to climb up to the second set of “Y” branches, and put some webbing around one of those for an anchor. I hadn’t done much climbing since becoming a dad, so I wanted to make sure I remembered more than one way to get up and down. As an exercise, I tied two prusik loops, and went up the rope that way. Which was a lot easier in my 20s. It took forever, and was hard. But at the time I did it for the fun of it, and didn’t imagine I’d be going up and down the tree very often. Once at the top, I set up a simple anchor, clipped myself into it, and looked around. Everything about it was bigger than you might imagine; the size of the thing really messes with your sense of scale from the top. What look like normal size branches are just huge when you’re on top of them; I could just barely reach around what I thought was a small branch to set up the webbing for the anchor. And it was so very, very high; I was above every roof in the neighborhood. There were one or two trees this big I could see, but none of them were as well-formed as ours. The wind blew. I looked around. And I loved being up there. Finally I rappelled down, and set up for my daughter to climb. She went up and down a few times, thought it was great. At one point she stopped, and said she wanted to stay where she was for awhile. She stood in the crook of the tree and finally yelled down that she could see the whole neighborhood — she was experiencing the same feelings I had earlier, really enjoying the space in that big old tree. When we finished playing around for the day, I tied cord to the climbing rope and pulled it through and down, leaving a loop of cord tied off so I could pull the climbing rope back up again another day. I had a very good sense I’d be going up into that tree at least a few more times; that day the first notion that it might even be a great spot to build a treehouse started to form. On to Part 2: What kind of treehouse?